Thanks to funding from the U.S. Forest Service and the U.S. Navy, Commissioner of Agriculture Adam H. Putnam announced that the Blackwater River State Forest will expand by 800 acres due to the acquisition of the Florida Forever Project Area Wolfe Creek Forest. The Florida Forest Service partnered with the Florida Department of Environmental Protection, Santa Rosa County, the Naval Air Station Whiting Field and the Trust for Public Land to secure the acquisition through the Forest Legacy Program. The land acquisition is home to a number of rare and endangered species and serves as a major wildlife corridor with frontage on Big Coldwater Creek. The land will also act as a buffer for the Naval Air Station Whiting Field, the busiest aviation complex in the world, and is crucial for protecting military training missions. 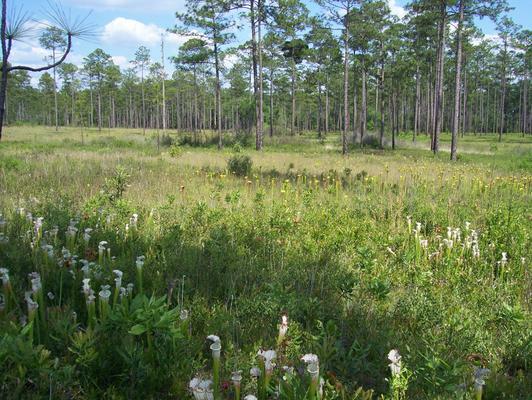 The Florida Forest Service will manage the tract as part of the Blackwater River State Forest, Florida’s largest State Forest with over 211,000 acres, by applying sound forest management practices. The U.S. Forest Service’s Forest Legacy Program, administered by the Florida Forest Service on the state level, encourages the conservation and protection of privately owned forest lands. Since 1990, the Florida Legacy Program has protected over 2.6 million acres of forest land throughout the United States. The Florida Forest Service, a division of the Florida Department of Agriculture and Consumer Services, manages more than one million acres of public forest land while protecting homes, forestland and natural resources from the devastating effects of wildfire on more than 26 million acres. To learn more about Florida Forest Service programs, visit FloridaForestService.com. For more information about the Florida Department of Agriculture and Consumer Services, visit FreshFromFlorida.com.